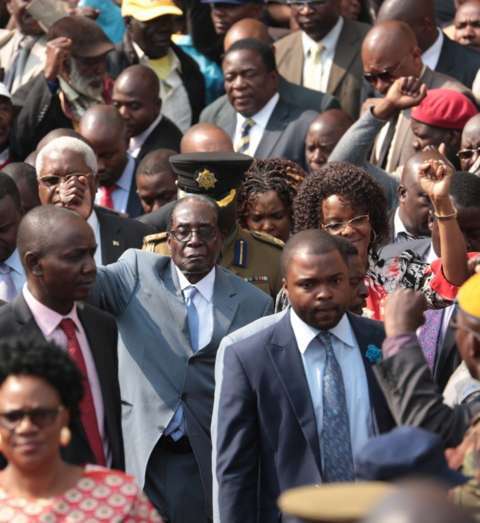 President Robert Mugabe was subdued when he emerged out of his Zanu-PF headquarters to see the thousands of ruling party supporters. He must be experiencing one of his most trying times. For six days he has been silent on the subject of the war veterans, who last week urged him to step down, saying they were withdrawing their support for him. It was a statement that must have rattled him as the usually buoyant 92-year-old did not look himself. However, as provincial party chairperson after provincial party chairperson began relaying messages of solidarity, asking him to continue his rule, he looked more rejuvenated. At that point, he smiled back, briefly had a chat with his wife before confidently walking to the podium to address the crowd. 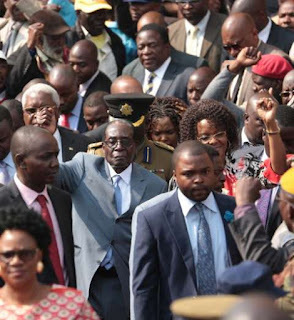 His message was aimed at war veterans, who have divided into factions over the battle for succession within Zanu-PF, but most of those in the audience were from the party’s youth and women’s leagues. He threatened to deal firmly with his detractors, punish wayward war veterans, warned foreign embassies not to undermine his government before preaching for unity within his party’s ranks. By the end he looked more like a man in control of his destiny.